Today in Masonic History Lewis Addison Armistead is born in 1817. Lewis Addison Armistead was an American Solider. Armistead was born in New Bern, North Carolina. He came from a long line of military officers. His father was one of five brothers who fought in the war of 1812. One of his uncle's was in in command of Fort McHenry during the battle that inspired Francis Scott Key to write the Star Spangled Banner. His mother's side of the family had congressmen and governors as it's members. Armistead attending the United States Military Academy at West Point, he would not graduate from the academy. Conflicting reports say that he resigned after smashing a plate over another cadet's head and other reports say it was due to academic failings. After leaving the academy, Armistead's influential father secured him a commission as a second lieutenant in the United States Army. His first duty station was in Arkansas. There he would marry Cecilia Lee Love, the couple would have two children. Marrying Cecilia in 1844, Armistead would serve in the Mexican-American War. After the war, Armistead and Cecilia would lose one of their children. Eight months later Armistead would lose his wife as well to an unknown illness. Armistead would marry again and take his family with him on his new tour of duty. His new tour would take him to Nebraska, Missouri, Kansas and eventually California. Armistead's second wife would never see California though, passing away in 1855 during a cholera epidemic. In California, Armistead became close friends with Winfield Scott Hancock. The two parted company as the American Civil War began. Hancock would serve for the Union and Armistead for the Confederacy. At the Battle of Gettysburg, Armistead would be placed in charge of a brigade under Major General George Pickett. Armistead would lead his brigade during Pickett's Charge. He placed his hat on the end of his sword and waved it around to rally his troops to keep moving forward. Armistead take his brigade to the High Watermark of the Confederacy during the battle, only to be pushed back immediately by an overwhelming Union counterattack. In the counterattack, Armistead was shot three times. 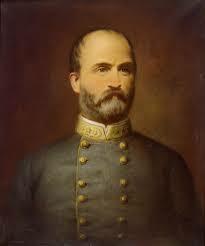 As he was being carried off the battlefield he encountered Captain Henry H. Bingham a Union soldier and Freemason. Armistead gave his possessions to Bingham and asked him to carry them to his friend Hancock, which Bingham did. Armistead was carried off the field to a Union hospital. Both the field medics and the doctors at the hospital expected Armistead to survive his wounds, after two days, on July 5, 1863, he would pass away from what the doctor would call a secondary fever. Armistead was a member of Alexandria-Washington Lodge #22 in Alexandria, Virginia.